Portico Library exhibitor Saima Rasheed presents an intimate demonstration of some of her traditional techniques and shares details of the history of Indo-Persian miniature painting. Current Portico Library exhibitor Saima Rasheed’s exquisite paintings bring together traditional techniques and contemporary subjects. Learn about her processes and the history of Indo-Persian miniatures in this one-off intimate session. Refreshments and materials provided. Places limited so register early to avoid disappointment. 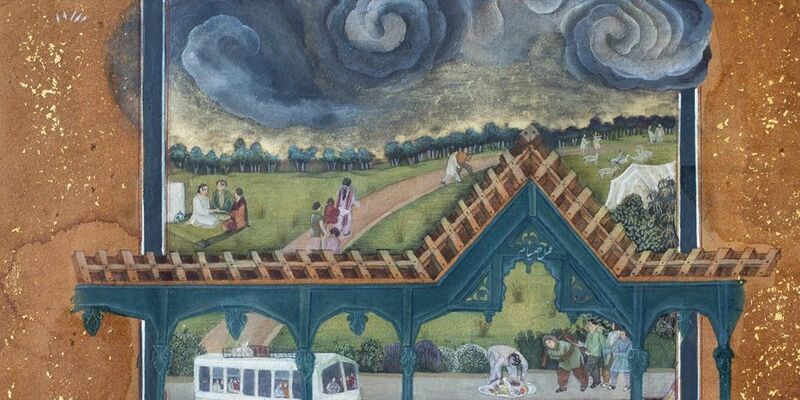 Saima Rasheed was born and grew up in Lahore, where she achieved her Bachelors Degree at the National College of Arts, Pakistan, specialising in Indo-Persian miniature painting in the traditional style. After further study and a solo residency at the L’École Supérieure d’Art d’Aix-en-Provence in France, she moved to the UK where she now lives with her family in the Derbyshire Peak District, working as an artist, illustrator and teacher. She has received an Arts Council England award, exhibited at Colombo Art Biennale and been nominated for the V&A’s prestigious Jameel Prize for international contemporary art and design inspired by Islamic tradition. Rasheed’s paintings are rooted centuries-old techniques, but like many of her contemporaries, she has rejected conventional themes for modern, topical ones. Through her choice of imagery she invites us to think about human rights within society’s constraints – of gender, traditions, taboos, religion and culture. Her work in The Portico Library's current exhibition, 'Recollection: Memory & Time', is deeply personal, portraying her own remembered experiences, both good and bad. For example, being forbidden as a female child over a certain age to play in the streets, and how this solitude led to hours of drawing. Also depicted and celebrated here are women on the cusp of creative moments or absorbed in their favorite activities – singing, knitting, drawing and reading – when unconscious impulses replace cultural expectations. Saima’s paintings – based on her direct and intimate observation of her friends and family – become focal points for shared reminiscence, like photographs in an album. 'Recollection: Memory & Time' is part of The Portico Library Reminiscence Project 2017 for people with dementia and their carers, supported by The Zochonis Charitable Trust. Introduction to Indo-Persian Miniature Painting is open to all.